Sold out! BASUNTI, INDIA 21 – 30 April 2018 + optional trek in the Himalayas for 3 days after. YOGA in India is always a magical experience. Basunti, in the heart of a beautiful wildlife reserve, makes it special. Whether you have been travelling in India or just want to escape the bustle of everyday life, yoga at Basunti is the perfect way to unwind, relax and reclaim yourself. There are at least two Yoga classes per day, leaving plenty of time for swimming, bird watching, and exploring on foot or by canoe. 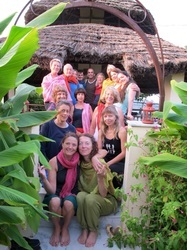 Classes are held twice a day, either in the circular, shaded yoga shala or on the roof terraces. The shala, directly overlooking the lake, has a thatched roof and a marble floor that keeps it refreshingly cool at all times of the day. 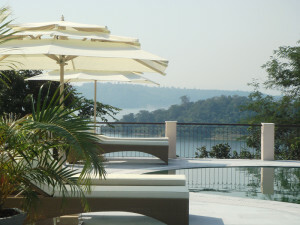 The main terrace has a 360° panoramic view of the lake and is perfect for morning and evening yoga sessions. The atmosphere at sunrise and sunset can be magical. Join Bridget for a yoga retreat in a wildlife sanctuary in the Himalayan Foothills. 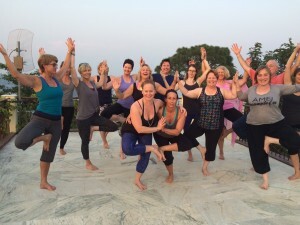 Enjoy 10 days of yoga and relaxation. Early bird price £1150 before 31st January 2018. Early bird price £1650 before end of January 2018. 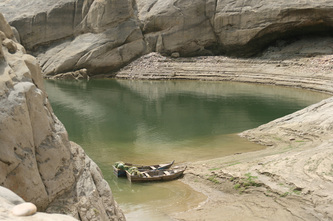 Price of trek to be confirmed. If you wish to combine this retreat with some travel around India we recommend you start your holiday with the retreat which will set you in good stead for the rest of your break. If you do plan to travel India please ask Bridget as she can offer suggestions of where to go.